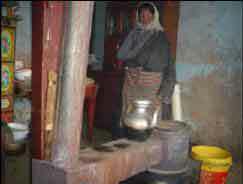 Aprovecho was asked by GTZ to look at and suggest improvements for the traditional stove being used in Tibet for cooking and house heating using animal dung. Aprovecho spent the Fall/Winter of 2005 looking at dung combustion and coming up with a combustion chamber that will burn dung efficiently. I will refer you to our report on that research but will focus here on my work in Tibet.